In 2006, a federal court judged four of the ‘Big Five’ US tobacco companies – Phillip Morris, RJ Reynolds, British American Tobacco, Lorillard (sold to RJ Reynolds in 2014) – to have been operating for more than half a century as a de facto criminal enterprise guilty of racketeering. In November 2017, US tobacco companies finally issued, through national TV and print media, a series of statements correcting their sixty year deception of the American public. They had been appealing the original judgement for over ten years. The ‘racket’ was the continued sale and marketing of tobacco products in full knowledge of their addictive properties and their causal connection to lung cancer. Under the Racketeer Influenced and Corrupt Organisations (RICO) Act 1970, these tobacco companies were held to have defrauded smokers i.e. obtained smokers’ money by dishonest means, specifically “deceiving smokers, potential smokers, and the American public about the hazards of smoking and second hand smoke, and the addictiveness of nicotine” (United States vs. Phillip Morris et al, 2006, p4). How does one deceive the public for so long (linguistically)? My approach to this question is to first identify the agents and channels of deceptive communication. We know who received the deceptive messages but who were the senders? Did they use agents/messengers? What channels did they use? The ‘Big Tobacco’ enterprise built an infrastructure of deception by establishing a number of front organizations i.e. groups that appear to independently support or be motivated by one particular purpose but are actually a ‘front’ for another group whose covert agenda they secretly serve. Front organizations are agent-messengers that appear to be senders. Examples of the forms that front organizations might take include think tanks, associations of consumers or workers, and single-issue interest groups. Chief among these was the Tobacco and Industry Research Council (TIRC), founded in 1954, which later changed its name to the Centre for Tobacco Research (CTR). TIRC/CTR was established on the strategic recommendation of Hill & Knowlton, public relations counsel to the Big Tobacco enterprise. Backed by money from the Big Tobacco enterprise, it ran a multi-million dollar research programme providing substantial grants for ‘independent’ scientific research into the health effects of smoking. This produced a body of research that obfuscated the link between smoking and cancer and left their causal connection as an “open question”. TIRC/CTR also funded research that diverted discourse away from the dangers of smoking by suggesting alternative causes of cancer such as air pollution, diet and genetics. This programme of decoy research clearly had a deceptive purpose. However, the research itself was not necessarily deceptive – it created doubt rather than false belief by challenging the anti-smoking research attracting the attention of the American government and health organisations at that time. Neither was this research directly responsible for the mass deception of the American public since the public was not the audience for scientific research. newsletters and booklets targeting medical professionals with favourable research summaries. public statements, comments made by tobacco-friendly scientists discrediting research that linked smoking with cancer. Whilst annual reports and newsletters helped communicate the tobacco deception to professional outgroups, as shown in Figure 1 below, press releases were the most influential channel for reaching the general public. Every publication and statement made by a scientist connected to the enterprise was accompanied by a press release. This would be sent out to thousands of editors and then transmitted to the general public through newspapers and popular magazines. Thus, the press release plays a doubly deceptive role; it reports the deceptive framing of the discourse around tobacco/cancer research and then amplifies its interpretation though popular media. Indeed, PR agency Hill & Knowlton prided themselves on their ability to spin “obscure scientific reports favourable to the industry into headline news across the country”. Below (Figure 2) is one example of press release distortion of research in the tobacco domain. This 1955 study from the British Empire Cancer Campaign (a forerunner of Cancer Research), published in the British Medical Journal, reports a nuanced set of findings in relation to the carcinogenic properties of smoking. It reports findings indicating that: i) tar is not carcinogenic in mice, ii) condensation from tobacco smoke is carcinogenic in mice and iii) carcinogenic effects vary between species so more research is needed. This nuance is lost in the press release, which seizes on the first finding related to tar and extends it to smoking and tobacco in general. The press release, authored by Hill & Knowlton, draws it authority by reporting the statement made by the TIRC chairman Timothy Hartnett and uses repetition to reinforce its point three times in the first page – “Outstanding British scientists could not induce cancer in experimental animals with tobacco smoke derivatives” / “Experiments conducted at several leading British medical research institutions had failed to induce any cancers” / “18 month experiments fail to show any connection between cancer and smoking”. The fact that this repetitive message itself references a message that is practically self-authored (considering the close relationship between TIRC and Hill & Knowlton, who even shared the same office at one stage) is indicative of the low information quotient in this press release. Yet providing information is arguably the main purpose of the press release genre. What we have here, then, is a deficient or deviant genre communication – inauthenticity (deception) has compromised the integrity of the genre. A problem may well be obscured, and its solution delayed, by the soothing acceptance of an oversimplified and immature [tobacco theory] hypothesis. The proponents of the tobacco theory have generated increasingly intensive and extensive propaganda. As a result, a non-scientific atmosphere, conducive to prematurity, unbalance, and inadequacy of public judgement, has pervaded the whole field. The prohibition concept discounts or ignores all considerations of smoking benefits in terms of pleasure, relaxation, relief of tension or other functions. Once again, in this case by allowing bias to enter annual reporting, a genre is compromised through performing a deceptive purpose. These two examples suggest that the tobacco deception was partly sustained by ‘genre fronts’ – communications that appear to serve one conventional purpose but in fact fulfill functions of another genre or are simply deficient. Press releases are more central to mass deception than annual reports because they are more frequent and produced for immediate impact in popular media. Press release spin is picked up by editors and transferred to newspapers and magazines – sometimes wholesale, sometimes with additional fervour. This resulted in a news environment that actively facilitated the disinformation strategies of the Big Tobacco enterprise leading to a massively misinformed general public. The selection of headlines, news articles and editorials in Figure 3 below reflect the general tenor of the ‘decoy discourse’ maintained by the tobacco industry, which involved: attacking the integrity of government scientists, casting doubt on environmental controversies such as the use of pesticides and climate change, and linking cancer to spurious causes. The confluence of tobacco advocates and climate change skeptics is a striking feature of this mass deception. Newspaper items come in a variety of sub-genres, for example news articles whose purpose is to present factual information and editorials that present an opinion. Editorials themselves can be written by newspaper staff or invited writers as ‘op-eds’. Both of these sub-genres can be used for deceptive means i.e. the presentation of false facts in news articles and the advancement of an undisclosed agenda in the case of editorials. In such cases, the news genre loses its features of objectivity and transparency and becomes distorted as ‘fake news’. Taking the ‘tobacco deception’ as a case study, it would seem that the infrastructure for maintaining this deception was built on the deviant use of a variety of genres – annual reports, press releases, newspaper/magazine items – that were connected by channels invisible to the general public i.e. front organizations and funded scientists. The schema presented above will be used in future posts to evaluate similar deception controversies in the environmental and health domains. Who is ‘we’? Investigating pronouns for deception. If you are ever arrested and asked to make a statement by the police on US soil, be careful with your pronouns. 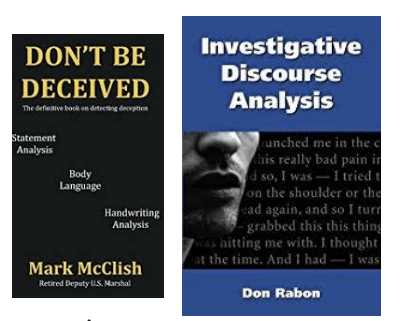 Law enforcement officers in the US are likely to have received training in analysing statements for deception from Mark McClish or Don Rabon, which means the pronouns you use will be inspected very closely. McClish and Rabon come in for a lot of stick from forensic linguists working in academia, due to the lack of citations and over-generalisations in their blogs and best-selling books. But to be fair, many of the leading academics working on lie detection have said similar things about the use of first person pronouns being an indicator of veracity. Newman, Pennebaker and colleagues, in their seminal work ‘Lying Words: Predicting Deception From Linguistic Styles’ provided some empirical support for the correlation between low self-reference and deception; subsequently it has been found to broadly hold in online dating profiles, business communication and criminal narratives (but, interestingly, not the case in consumer reviews which use ‘reader engagement’ as a deception strategy). It should be noted, however, that Newman and Pennebaker’s prediction rate was 67% – that is wrong 1 in 3 times. Consequently, simply counting the use of any first person pronouns is not by itself the magic cue for deception detection. There are a number of different first person pronouns – I, me, my, mine, myself, we, us, our, ours, ourselves. Not only do these have different strengths in terms of socio-psychological ideas of distance and commitment (compare ‘I was hit’ with ‘The car hit me’) but they work differently linguistically. For example, ‘I’ and ‘me’ will correlate with verbs, ‘my’ with nouns; also ‘I’ correlates with stance and modal verbs (‘I thought’, ‘I tried’, ‘I would’) so is a more ‘active’ first person pronoun than the passive ‘me’. The above also applies to ‘we’, ‘us’ and ‘our’. 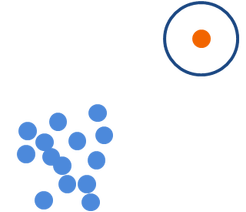 In addition first person plural pronouns have the additional pragmatic parameter of clusivity to distinguish who exactly is included in the ‘we’ (see Figure 1 below). And there is the linguistic phenomenon of nosism which includes royal and editorial ‘we’ (see Ben Zimmer’s excellent 2010 article to fully appreciate the complexities of ‘We’). A case in point is ex-UK Prime Minister David Cameron’s response to questions about his alleged use of off-shore tax havens to avoid paying tax, as revealed in the Panama Papers leak. In April 2016, 10 weeks before the EU Referendum and his subsequent resignation, Cameron was taking questions about the upcoming referendum and speaking in support of remaining in the EU at a town-hall style Q&A event held at PriceWaterhouseCoopers’ Birmingham offices. Figure 2 is a transcript of David Cameron’s response to an unexpected question from Sky News journalist Faisal Islam regarding the controversy over his connection to an offshore investment company (Blairmore Holdings) owned by Cameron’s late father. Cameron denied owning any shares or offshore investments but was roundly criticised for his evasive answer (Cameron restricts his answer to the present tense, despite Faisal Islam’s specific temporal reference to the past and the future – lines 4-5). Five days later, under public pressure to resign, Cameron was forced to admit that he had owned shares in his father’s business (which he sold at a profit shortly before taking office as Prime Minister). Figure 2: Transcript of David Cameron’s first public response on the Panama Papers allegations. Given during a Q&A with workers at accountancy firm PWC in Birmingham, 5 April 2016. David Cameron’s use of pronouns is an excellent example of linguistic duplicity, shifting between inclusive ‘we’ (yellow), exclusive ‘we’ (red) as well as ‘I’, all in reference to himself; the identities referred to by ‘I’ are split between David Cameron as a UK citizen and his role as Prime Minister. Furthermore, the scope of ‘we’ varies within the text and is sometimes unclear. In answer to a question about “you and your family” with regard to the financial business of one’s late father, one might expect ‘we’ to refer to some aspect of family. However, Cameron initially moves to include the whole audience (and viewers) in his personal financial affairs by referring to ‘we’ as a nation with the contextual reference “our tax authority” and later “our own country” (line 8). In the middle of his response, a different (exclusive) ‘we’ appears mid-sentence – “I have a house, which we used to live in, which we now let out while we are living in Downing Street” (lines 16-17). There is no explicit reference to the scope of this ‘we’ but the reference to personal property ownership means one can assume that is not the national ‘we’. If one assumes that it is the ‘we’ originally asked for in the reporter’s question – i.e. “you and your family” – then Cameron has violated the right frontier constraint (Webber, 1988), which stipulates that anaphoric elements such as pronouns are interpreted in ambiguous cases by reference to information at the end of the previous discourse unit i.e. the right frontier (for languages with left-to-right scripts). That Cameron returns to ‘we as a nation’ for the remaining text further highlights his dynamic use of pronominal reference. The linguistic duplicity displayed by David Cameron above is in stark contrast to the language he used when owning up to his involvement with Blairmore Holdings in a hastily-arranged national TV interview. As the transcript shows, Cameron doesn’t use ‘we’ at all in response to similar questions. This case study shows that assessing veracity and potential deception by tracking pronoun use is valid but more complex than simply counting; the inherent capacity for linguistic duplicity is contained within a complex system of deceptive pragmatics.